Former London PR agent Agatha Raisin still hasn’t adjusted to village life, where the only prospect for a hot evening out is a meeting of the Ladies Society. And since her overtures toward James Lacey—the retired military man next door—have failed, Agatha jumps at the chance to visit the new vet, who’s single and good-looking. Although Agatha’s tabby hasn’t a thing wrong with him, Hodge endures having a thermometer shoved up his bum in the name of romance. Unfortunately his sacrifice is all for naught when the vet is soon found dead next to a high-strung horse. Nadal mnie to bawi, choć to takie czytadło. Ok, I LOVED the second book in this series. The main character is pretty hilarious. There was a laugh out loud scene involving a broken sink in a pub that had me laughing while sitting in a coffee shop. It's rare for me to actually laugh out loud while reading. Fun, rather fluffy, but enjoyable. 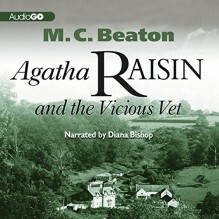 Another good book by MC Beaton. I love Agatha Raisin. She's not pretentious and she most of the time says what she feels. The story was good and I had no idea who the killer was. That makes a good mystery. bookshelves: cosy, mystery-thriller, winter-20102011, published-1993, midlife-crisis, flufferoonies, aga-saga Read on December 13, 2010 Thinking about Agatha, she is perhaps how Julia from the Hilary Tamar stories would have been in mid-life.